ICAN Meeting with the President of the Norwegian Parliament, Mr Olemic Thommessen. On December 10 in Oslo, the International Campaign to Abolish Nuclear Weapons (ICAN) was awarded the Nobel Peace Prize. ICAN started as a grassroots campaign in 2007. Its aim was to shift the paradigm of discussion about nuclear weapons from security and deterrence to the environmental and humanitarian effects of nuclear explosions. As the prize demonstrates, ICAN has succeeded brilliantly. But, as ICAN acknowledges, this is still only the beginning of the end of nuclear weapons. A key development was the holding of three governmental conferences on the humanitarian impact of nuclear weapons in Norway, Mexico, and Austria. At every turn, the nuclear weapon states and their allies would claim the humanitarian narrative was reckless and dangerous. IAN remained unwavering in its message: Nuclear weapons must be banned. By the conference in Mexico, held in early 2014, ICAN was calling for the commencement of negotiations on establishing an international legally binding instrument to ban nuclear weapons. After all, land mines, chemicals and biological weapons were banned through their respective instruments, and then global norms were established against their use. The negotiations for the ban treaty concluded in July 2017. 122 states voted to adopt the treaty. It opened for signature on September 20 and more than 50 states have signed it. It will enter into force when ratified by 50 states, probably in the next one to three years. At the Nobel Peace Prize ceremony in Oslo, the Nobel Committee Chair Berit Reiss-Andersen praised ICAN and condemned the use and threat of nuclear weapons on humanitarian, moral and legal grounds. Speaking at the ceremony, ICAN Executive Director Beatrice Fihn stated that it is insanity to allow ourselves to be ruled by these weapons. Many critics of this movement suggest that we are the irrational ones, the idealists with no grounding in reality. That nuclear-armed states will never give up their weapons. Following Fihn’s speech, Setsuko Thurlow, a survivor of the atomic bombing of Hiroshima, recounted her harrowing survival of the atomic blast that annihilated her school. She heard a voice in the distance, which told her to keep pushing towards the light. Indeed, the new light and hope is the ban treaty. This treaty must enter into force and it is time for all nations to sign it. All responsible leaders will sign this treaty and history will judge harshly those who reject it as highlighted. However, the Norwegian parliament is set to take a vote on convening an inquiry in which parliamentarians, with the engagement of civil society, will examine the consequences of signing and not signing the ban treaty. Furthermore, both the Prime Minister, President, and Chair of the Committee on Defense and Security met with representatives of the ICAN in Parliament. 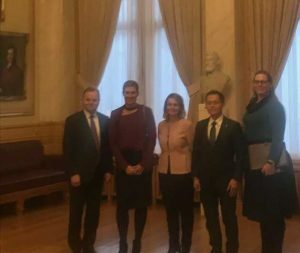 At the press event with the President of Norway, Ms. Grethe Östern, Head of the Norwegian People’s Aid’s Nuclear Disarmament Project, said that it is absolutely vital for the Norwegian parliament to engage in discussions about the utility and the risks related to nuclear deterrence. Building upon Östern’s statement, Ms. Susi Snyder of ICAN and Pax explained that parliaments in Switzerland, Sweden, and Italy have passed resolutions in which they have instructed their respective governments to explore the ratification of the ban treaty. Snyder concluded her remarks by stating that the parliamentarians will have to think about the consequences of not joining the treaty. They must think about the following question: Are you willing to then be complicit in using nuclear weapons? We now have the choice to live a world free of nuclear weapons. It is time for the people everywhere to discuss this momentous choice. Thank you ICAN, for changing the status quo in the nuclear disarmament field. The post The Journey to Oslo appeared first on Inter Press Service.